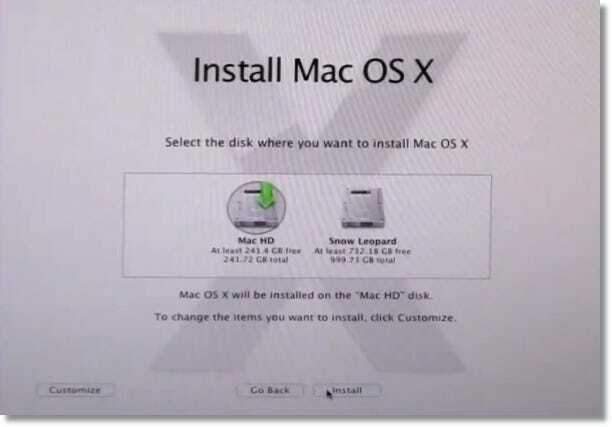 If you remember, we have already showed you how to pick the right hardware for building a hackintosh, how to Install Mac OS X Snow Leopard on it, and upgrade to Lion using xMove. But now, there’s a new and improved guide, by none other than Tonymacx86. We’ve been using his guides in the past, and this one is by far, the best one out there. We would like to thank him for his contributions to the hackintoshing community! 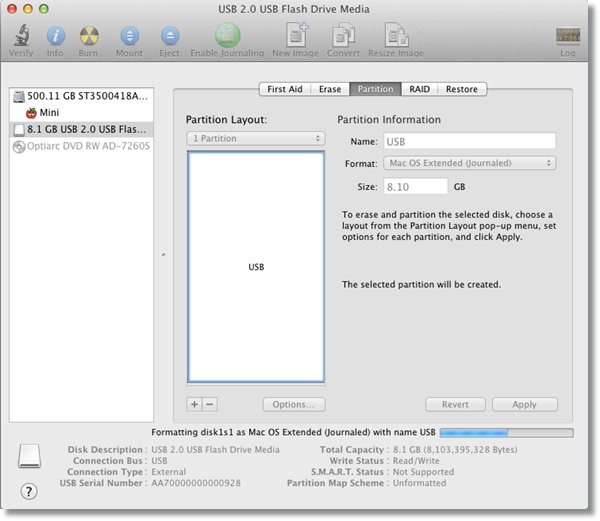 So by following this guide, you can install Mac OS X Lion on your hackintosh using only a USB thumb drive. The guide is called UniBeast. Follow this guide, and you’ll be able to do a clean-install of Mac OS X Lion on your hackintosh, or upgrade your existing Snow Leopard installation (that’s your personal preference). There’s only one thing to remember. You’ll need access to a system running Mac OS X (Snow Leopard or Lion, doesn’t matter), only for the USB drive preparation steps. This system could be a real Mac, or it could be your existing hackintosh as well. Now let’s get started with the guide. Since the guide itself is self-explanatory, we are just going to follow along here. You can read the original guide here at tonymacx86’s blog. For this one, you need a system running Mac OS X, a Mac App Store downloaded copy of Mac OS X Lion (downloaded as an app) OR a Mac OS X Lion Recovery USB (available from an Apple retail store and/or from the Apple online store). You’ll also need a USB thumb drive, preferably 8GB or larger. Also, download the UniBeast package from the Downloads section of tonymacx86’s website (you need to be a registered user for that, so register first, because you might also need to post on the forums for help if you come across a problem). Last but not the least, you need patience, tolerance, and the enthusiasm to make things work! First, let’s get the installation USB drive ready. Make sure you have a system running Mac OS X at hand. Attach the USB thumb drive, and open Disk Utility from Application/Utilities, or just type Disk Utility in Spotlight. Select your USB drive in the left sidebar, and click the Partition tab. Under Volume Scheme, select 1 Partition, and give it a name (Installer, for instance). Make sure that the format is set to Mac OS Extended (Journaled). Next, click the Options button. Select Master Boot Record, and press OK. Now you’re ready to apply the changes to the USB, so click Apply, and click Partition. Wait a couple of seconds till the process completes. Now it’s time to copy the installation files to the USB drive. As mentioned earlier, you can either use a downloaded copy of Mac OS X Lion (from the Mac App Store) or you can use the Lion USB Thumb Drive. Either way, you should have the preferred installation mode in your possession, i.e. the downloaded Install Mac OS X Lion App should be in the Applications folder of your Mac. Or if you’re using the Lion USB thumb drive, make sure to have it attached to your computer before proceeding to the next step. So let’s run UniBeast. Accept any license agreements, and select your USB thumb drive when you arrive at the Destination Select screen. Upon clicking Next, you’ll see some options. Now if you’re using the Mac App Store version of OS X Lion, select the “Mac App Store” option. If you’re using the Lion USB thumb drive, select the “Apple Store” option. But remember, you have to select only one option. If you’re going to install Lion (using this USB thumb drive being prepared) on a laptop, select the “Laptop Support” option as well. Once done, click Next, enter your password, and have a cup of coffee. This will take a while (anywhere from 15 to 20 minutes). 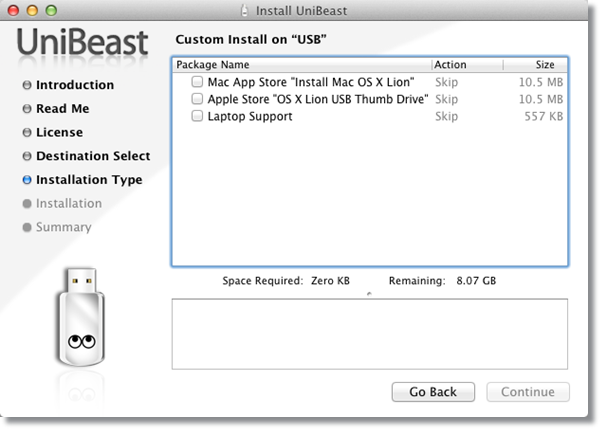 When the UniBeast installation is complete, you can use this USB thumb drive to install Lion on a Hackintosh, for a fresh install, or as an upgrade to existing Snow Leopard. If you want to install Lion alongside an existing Snow Leopard installation on a hackintosh, be sure to create an empty partition first using Disk utility (or just use another empty hard drive, if you want to). Be sure to have the same BIOS settings as recommended in the iBoot + Multibeast guide, further explained here. In short, set all hard drives to SATA mode (AHCI), enable HPET, use less than 4GB of Ram (for installation only), and make sure no extra peripherals are connected to the computer. Ready to install? Let’s go. Make sure your booting sequence is set to boot from USB drive first. 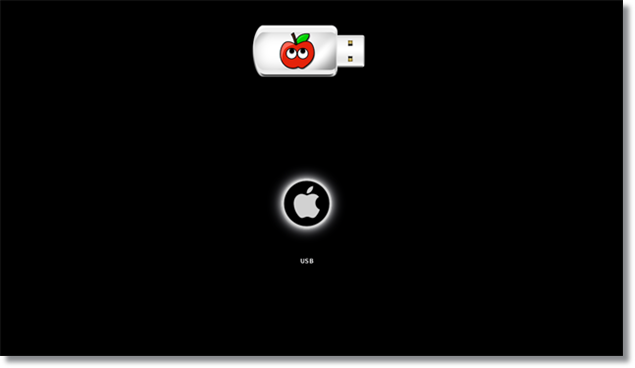 Reboot your hackintosh with the USB drive attached. 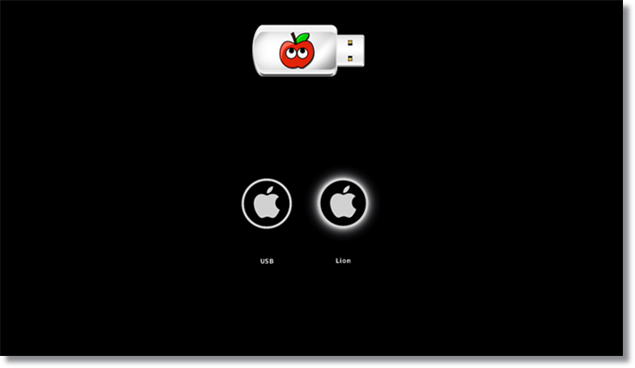 Once you reach the bootloader screen, you’ll see the installer partition you created earlier (here, it’s named “USB”). Now, remember what we learned about boot flags? You’ll probably need to enter some of them to reach the installer. Luckily, tonymacx86 has already defined a couple of them, so be sure to use the ones applicable for your hardware configuration. TIP: Additionally, you can boot with –v (alongside the other boot flags) to see where the installer loading stops or causes a problem, and you may also use the –x bootflag (for booting in safe mode). Note down the boot flags that work for you. This was the only tricky step in the entire process. Once you reach the installation screen, it’s just a matter of going through a couple of standard installation steps like selecting the language and specifying the destination partition/hard drive for installation (if you’re going for a clean install). If you’re going to update an existing Snow Leopard installation, the next couple of steps (regarding work with Disk Utility) may not be required, and once you reach the Destination Select screen, the partition will already be there, just select that, and start the installation. In case of a clean install, make sure you have prepared the destination partition beforehand. If not, prepare it first using Disk Utility. On the menu bar at the top, click Utilities>Disk Utility. Once Disk Utility loads up, select your hard drive, and click the Partition tab. Under Volume Scheme, select 1 Partition, give it a name (Lion, Mac HD, anything you want), and set the partition format to “Mac OS Extended (Journaled)”. Click the Options button, and make sure “GUID Partition Table” is selected. If it isn’t, select it and press OK. Once that’s done, press Next on the installer, select the drive you just created, and install Lion right away! When Lion finishes installing, you need to restart your hackintosh. And once again, you have to boot from the USB you’ve created. This time, you’ll have your Lion partition showing up at the bootloader screen. Use the arrow keys to highlight it, and press Enter to boot from it. You might consider any boot flags as well which helped you reach the installer screen. Once you get to the desktop, congratulate yourself, you just installed Mac OS X Lion on a PC! All that’s left to do is to download and run MultiBeast to enable any non-functional devices and to install a bootloader (using EasyBeast or UserDSDT) so that you may not need the USB to boot into Lion on your hackintosh. The multibeast installation tips and tricks are explained in detail in the first and second parts of the How-To Geek Guide to Hackintoshing, so be sure to have a look at them. And there you have it. Mac OS X Lion, on a custom built hackintosh. We will keep you updated on any further advances in the hackintoshing world, so expect more! All thanks to tonymacx86 and his team for putting together an easy to follow guide. This guide is just an explanation of the original. The tonymacx86 logo and other logos are the trademarks and registered copyrights of tonymacx86. Screenshots taken from the original guide. 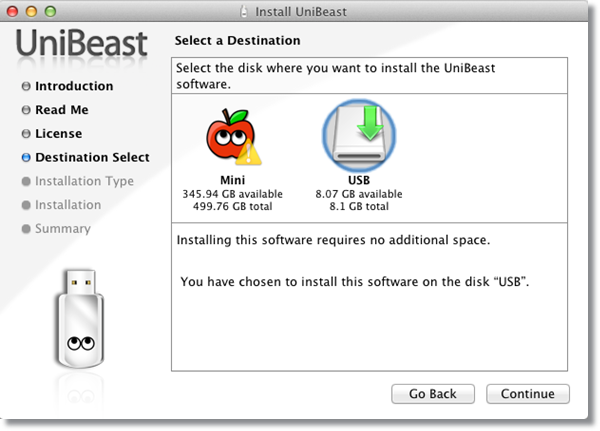 Here are some video tutorials explaining how you can use the UniBeast method to install Mac OS X Lion on a hackintosh. This might give you an idea of how it’s actually done, and then you may try it for yourself.